It is important to remain versatile in the jewelry business. Customers come through your door each with their own needs, and no jeweler wants to turn away a customer due to a lack of tools to complete the job. A 3D scanner is a versatile solution to many problems that you’ve likely faced in your own business. Customers want their family heirlooms replicated, a shadow band to match their engagement ring, or they want a piece with a unique or odd-shaped gemstone. Without pre-existing CAD files, creating replicas or shadow bands with a perfect fit can be a time-consuming hassle to get right. And many jewelers risk damaging gemstones when they try to create pieces without the 3D model of the gem. A 3D scanner can add consistency and versatility to your business and land you jobs from any customer coming through your door. If you’ve ever produced shadow bands without an accompanying CAD file, you know how difficult it is to get a perfect fit. Jewelers will often have to turn away customers because they don’t have the right tools or spend days on the bench trying to create a compatible shadow band for a ring. The process is time consuming due to how difficult it is to get perfect dimensional accuracy with the human eye. 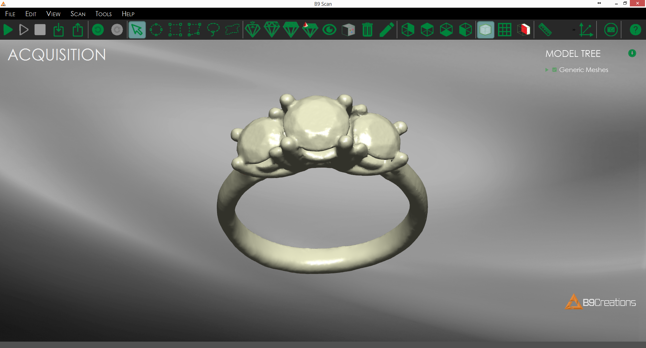 A 3D scanner, like the B9 Scan 350, can create a 3D model of a ring with accuracy impossible to otherwise achieve. The high level of accuracy means that your shadow bands will be done right the first time, every time – delivering satisfaction to your customers. Scans can be completed in minutes instead of hours saving you time and money as well as shortening wait times for your customers. "Shadow bands are a significant part of our jewelry business. The B9 Scan 350 increased our efficiency 35-45%. Plus it cuts down on error rate and ensures a perfect fit every time." Have you ever had to turn down a job reproducing an heirloom because it was either too difficult, too time consuming, or you didn’t have the right tools? We know that as a Jeweler you want to satisfy even the most difficult jobs to build lifetime relationships with your customers. 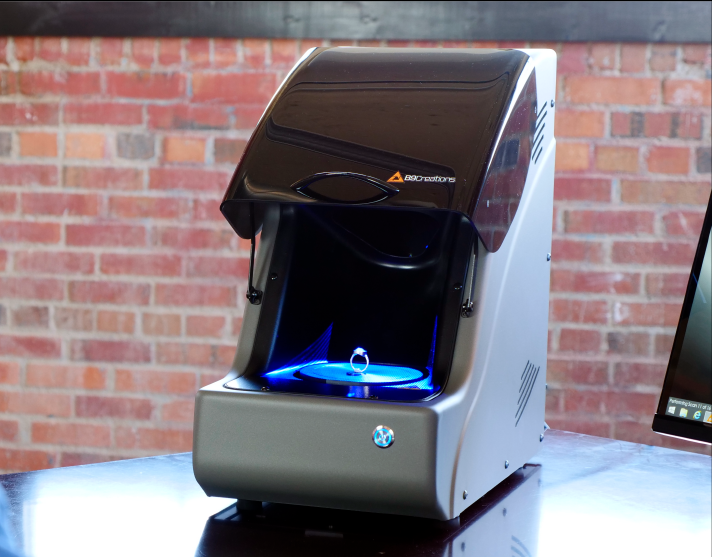 A 3D scanner will allow your business to fulfill your customer's needs, and the B9 Scan 350 is a great choice for high-detailed scanning and fast reproduction of family heirlooms. Fernando laid their concerns to rest when he demonstrated that the B9 Scan 350 he could not only produce an exact replica of the ring, but also add structural integrity to the new engagement ring, ensuring that it could be handed down for generations to come. “I felt 100% confident that Irelia Fine Jewelry could deliver the heirloom piece once they showed me their 3D scanner and tools in action. The B9 Scan 350 earned Irelia Fine Jewelry a lifelong customer as they become part of one of the most defining moment's of Kyle's life, his engagement. Read the full story here. 3D scanning also saved a soldier's dog tag, a vintage, hand-stamped sheet metal treasure over 60 years old. Kurt, a jeweler, had been charged with replicating the cherished heirloom. He tried every method he knew, and not a single on was successful. Ready to give up, he too turned to Irelia Fine Jewelry. Using default settings, in a mere 10 minutes Irelia Fine Jewelry a high-detail STL file of the tag. From there it was as simple as importing the model into Matrix and creating a thicker back plate, so this new piece would last a lifetime. Gemstones are a beautiful addition to jewelry pieces but can sometimes be a challenge. Designing a piece to fit an odd-shaped gem is a time-intensive process and errors can be extremely costly if a stone is broken, chipped, or loosely mounted. Odd-shaped gems give pieces a one-of-a-kind feel, and the ability to consistently create jewelry with them can have huge payoffs. 3D scanning a unique gemstone ensures that exquisite jewelry can be created - and re-created - without the risk of human error. Don’t take the risk of accidentally ruining a precious gemstone. 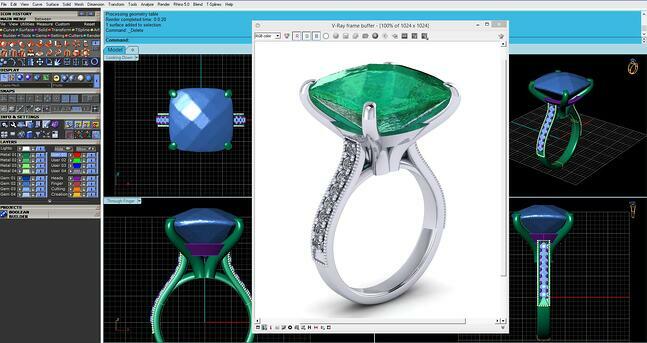 Instead, use a 3D scanner to get a high-resolution scan of the gemstone in minutes. Then you can design your piece in CAD with absolute certainty that you will get the perfect fit every time. Add versatility to your business and profit to your bottom line with the B9 Scan 350. Eliminate the risk of damaging gemstones and stop turning customers away for difficult shadow bands and replicas. The jewelry business is built on word of mouth. Be the jeweler that is known for acing the jobs the others can’t. Learn more about the B9 Scan 350, see it in action, and scroll through our scan gallery showcasing everything from engagement rings and shadow bands to family heirlooms and gemstones.